Introducing the SkyMax high-end DT Heat-pipe VGA graphics array cooler. This triple-fan VGA cooler utilizes five (5) copper heat-pipes that quickly transfer the heat away from the GPU heat source. The SkyMax offers powerful cooling solution for the latest Nvidia and ATI Graphic processors up to 180 W TDP. The five heat-pipes utilized are high performance sintered powder heat-pipes which guarantee swift heat transfer. The SkyMax is equipped with three (3) DC fans, one (1) 90 mm centre fan and two (2) 80 mm fans which generate a huge air pressure of 36.5 CFM. This VGA Cooler is supplied with a complete set of mounting accessories such as clips, screws, S420 thermal interface material, MOS and RAM heat-sinks. Due to the open heatsink design the air can easily cool the entire Graphic Card. 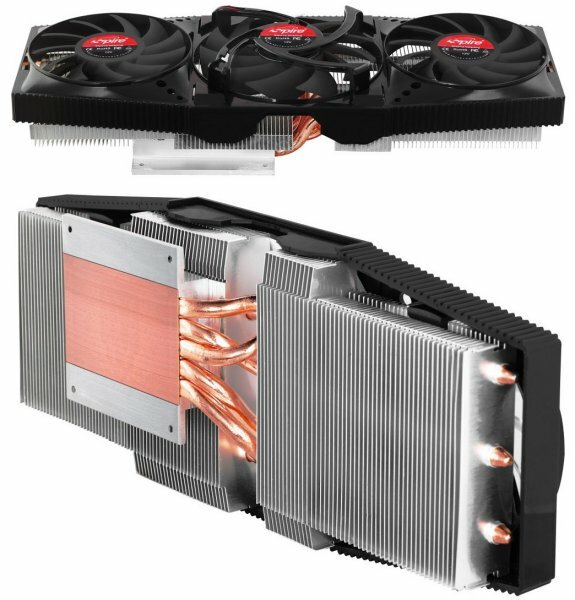 You can easily install this VGA cooler onto your Gforce and Radeon chipset based graphic cards. Powered by innovation and performance guaranteed the SkyMax is the professional solution for pc enthusiasts and gamers alike - offered to you by Spire. - Three DC fans, silent at 19~41.5 dBA Max. The SkyMax is compatible with most NVIDIA and ATI based graphic cards on the market today. For exact Chip / Card compatibility please review the listed VGA Chip models that are applicable for the SkyMax VGA cooler on the product specification page ID145 (url down below).